> CenturyLink > Unlock IT agility with a hybrid infrastructure solution. Today’s fast and furious pace of business change is driving extreme demand for IT infrastructure agility. But even as the demand for agility must be met, so must the need for 100 percent availability. 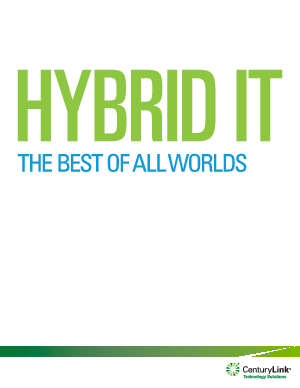 In “Hybrid IT: Best of All Worlds,” you’ll learn why this situation is leading many IT decision-makers to re-evaluate and re-imagine their core infrastructure. And, as a result, they’re outsourcing a growing proportion of it, utilizing a hybrid array of different approaches – such as data center colocation, managed services and cloud solutions. This allows decision-makers to focus more of their resources on delivering business applications – not managing the day-to-day operations of data centers.